Let’s introduce you to Morgan Marta! 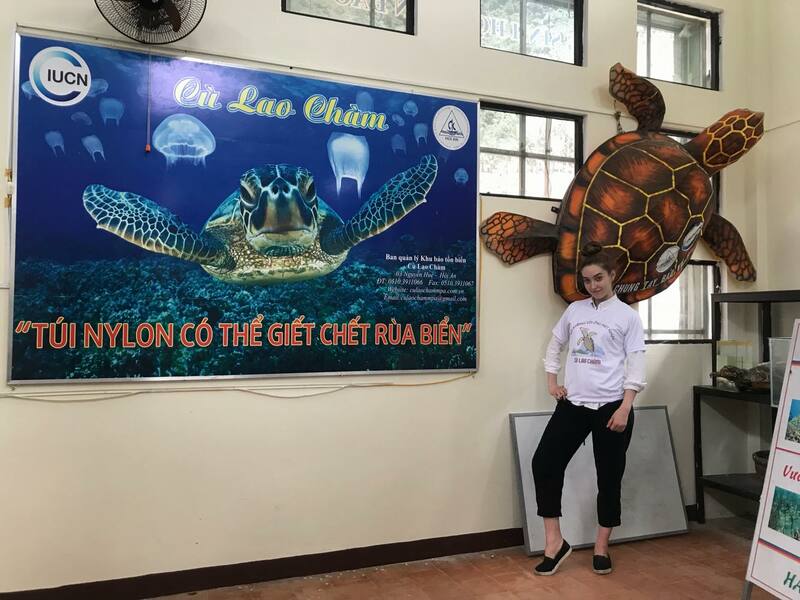 Morgan has been working at the Cu Lao Cham – Hoi An Biosphere Reserve in the central part of Vietnam for six weeks and has recently finished up her time in Hoi An. When she finished, she gave a presentation covering what she has learned during her time. We will summarize her presentation and share with you her very interesting findings. But first, a little about Morgan! Morgan is from Ottawa, the capital of Canada. This coming fall she will be starting her fourth year at Carleton University, one of our newest partners! At Carleton, she studies Global and International Studies specializing in Globalization and the Environment (BGInS). Some of Morgan’s favorite topics within her studies include climate change effects on humans, gentrification and displacement, globalization and urbanization in order to attract investment and tourists (creating a global image), and contrasting experiences in the city (housing, livelihoods, who is in place and out of place in the city). With Morgan’s studies and interests, she was able to have an amazing experience that she really enjoyed, and she could apply and improve the skills she already came with. She gained valuable work experience and can apply what she learned in her future studies and research. This was a once in a lifetime experience for her, and she certainly did not waste it! Let’s see more about what Morgan learned during her time in Vietnam! During her time, Morgan noticed an abundance of natural resources around her such as fresh fruits and vegetables, ocean, beaches, and beautiful and diverse landscapes. In addition to what Vietnam has to offer naturally, the people also bring a rich culture with many traditional foods, clothing, agricultural practices, symbolic buildings and pagodas, and many, many more! Because of all of these things Hoi An is a UNESCO recognized world heritage site. This all results in a lot of tourism, which is great for the economy, but the environment unfortunately takes a hit. Vietnam is in a generation of plastic waste that cannot continue to go unnoticed because of the great harm that comes with being unable to properly dispose of single-use plastics. In addition, tourism also brings in a lot of urban development like hotels, resorts, restaurants, attractions, cafes, etc. in which the natural landscape must be destroyed. There is a great need for there to be a response to climate change and human activities throughout Vietnam, but especially around Hoi An. Some of the major things that Morgan noticed that need a solution in the area are beach erosion, flooding and drying out of the Thu Bon River, and salt invasion into the freshwater system of Hoi An (to clarify, she added that her mentor told her “they always have to keep moving their freshwater supply for the city uphill because of the salt invasion from the ocean”). In order to maintain tourism in the area, these issues need to be addressed. One of Morgan’s mentors, Dr. Trinh, explained how the main problem in the city is waste which contributes to the other problems in the city as well. The problem of waste creates the need for there to be landfills on the Cham Islands, these could potentially close down if less waste was created. 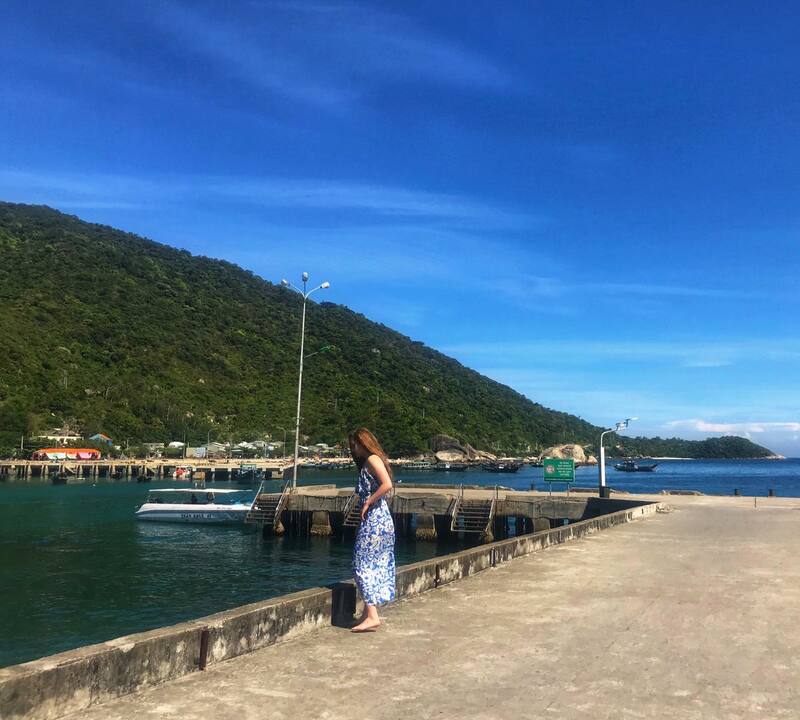 The tourists come to Hoi An to enjoy the beauty of the Cham Islands, but if the waste is not properly taken care of, the image of the Cham Islands will be diminished in the eyes of tourists. In addition, boat tours could be affected if the water is polluted because people will no longer want to participate floating through dirty water. Therefore, it is important to first address the problem of waste in order for tourists to continue visiting and also to benefit the local residents of Hoi An. Morgan took her findings from Hoi An and was able to apply her new knowledge to her hometown. Like Hoi An, Ottawa also has an abundance of natural resources such as trees, bodies of water, lakes, and beaches. In Ottawa, there is also a rich culture, but in a much different way. Because Canada is a melting pot of cultures, there is a lot of cultural diversity in the capital. And because Ottawa is the capital, there are also many attractions like the Parliament Buildings and national museums. This results in issues such as urbanization, the construction of more stores and houses and people moving into the city, and gentrification, the displacement of individuals who can no longer afford expensive rent prices, and the moving in of the creative class and white collar elites. There is a need to compete with other cities on a global scale creating developments such as Lansdowne and the Lebreton Flats. Like Hoi An, there is also a generation of plastic waste that must be reduced. As Canada is a more developed country, there are some things that have already been implemented to help these issues. These can be applied to Hoi An. Environmental Education: teaching people all throughout their lives about how to care for the environment, from elementary school to the university level. Separating Waste: blue bins for plastics and metals, black bins for paper/cardboard, and green bins for organic waste. Advertisements Informing Individuals: advertisements placed in public buses, on the news, and social media to inform the public of how to properly recycle and what they can do. As you can see, Morgan certainly learned a lot and was able to contribute a lot as well. We are so proud of Morgan and the work she completed during her time in Hoi An! Environmental concerns are on the rise in Vietnam, as they should be. With such a beautiful country, we should be focused on preserving it as much as we can! Thank you so much for sharing your work with us, Morgan. Interested in a similar program? Follow us here for more information on internship/study abroad programs in Vietnam. Or visit our Reviews page for more sharing from alumni about their internship in Vietnam!